Design your own individualized learning adventure (dare to try something new!) 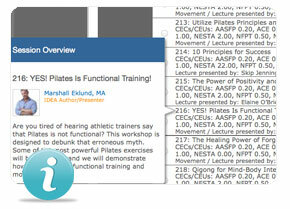 from the largest, most comprehensive selection of topics available in the industry today. Sessions are assigned on a first-come, first-serve basis. This page provides instruction for selecting your sessions. 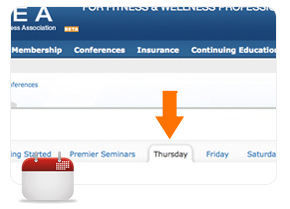 Select the sessions you wish to attend by date by clicking any of the tabs located near the top of the page. 2. Read about sessions and presenters. Roll your mouse over a session name to read the description. Click on a presenter's name to see all the sessions s/he's presenting. You reserve a seat in a session when you select it. 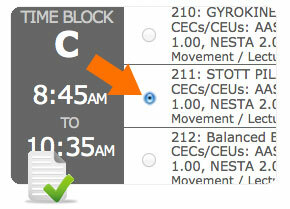 You give up that reservation when you select a different session or choose "Leave time block open." Spend as much time as you need selecting the rest of your sessions--we'll hold your seat until you give it up. 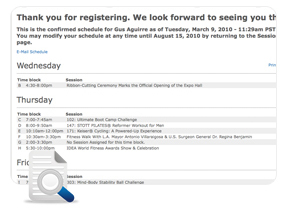 Your schedule not only shows the sessions you've chosen, but also highlights time blocks you missed. 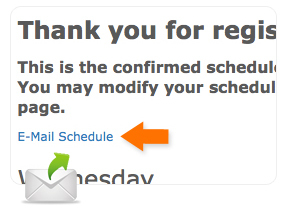 You can select to email your schedule to yourself and even a friend by clicking the "E-Mail Scheudule" Link on the session selection confirmation page. 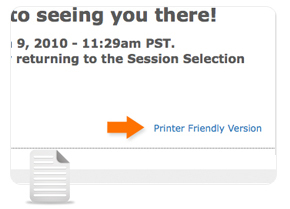 You can print your schedule by clicking the "Printer Friendly Version" link on the session selection confirmation page.